Truths About Parenting Preschoolers. 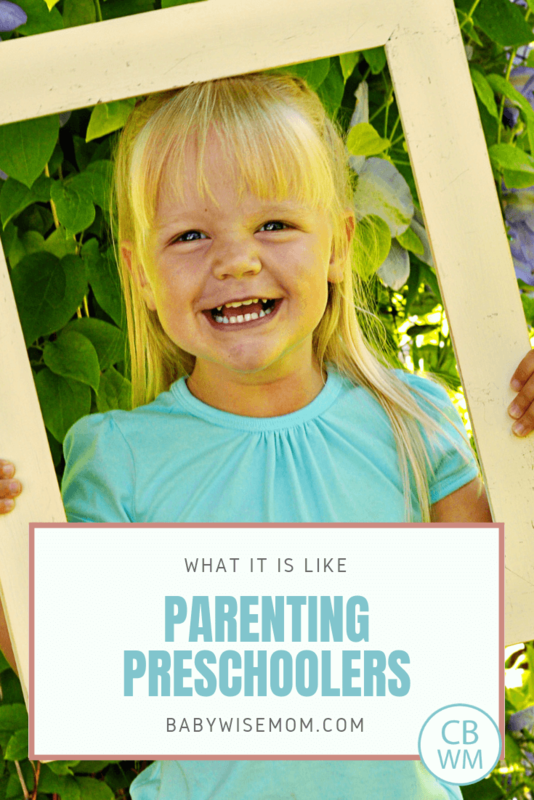 What it is like parenting preschool children. Parenting tips to get you through the preschool years. I love having a preschooler in the family. 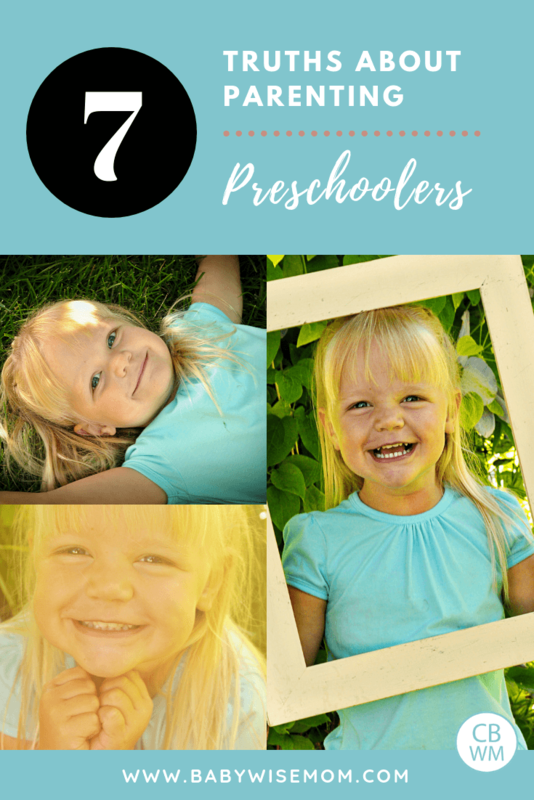 Preschoolers can be hard, but they also bring so much life and joy along with them. Here are seven things that are true about parenting preschoolers. This is the first thing that must be said. Preschooler emotions are killer. Not every preschooler is going to be highly emotional. I cannot write a post letting you know what to expect when parenting a preschooler, however, without first addressing emotions. When my second child, and first girl, turned four, her personality seemed to change. She was a bundle of emotions. Everything set her off. Her emotions could flip on a dime. I asked moms of girls if their daughter had been emotional at four, and many said yes. I didn’t know how I could face four with two more girls. Of my four children, two were highly emotional as four year olds two were not. It isn’t just girls who can be emotional at age 4. You can see that with boys as well. 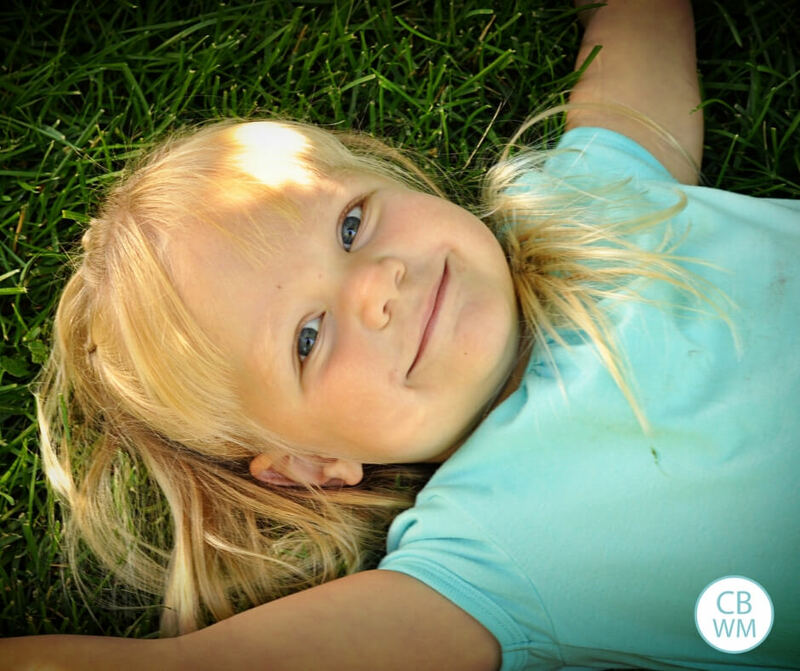 Here is a post I have on How To Respond to Your Emotional Preschooler. You do not want to stifle emotions; your little one needs to learn a healthy way of expressing that emotion. Beth said: Their emotions can be intense, unpredictable and overwhelming for everyone concerned! Especially little girls (at least in my home). Sheri said: YES. The emotions are crazy with my 4 year old! It’s hard some days to know how to respond & help her work through things. Your preschooler will be able to do so many more things independently. He will be able to get dressed on his own. She will learn to buckle herself in. He can put his shoes on. She can brush her teeth. There is a lot a preschooler can do! A preschooler often finds herself caught between wanting to grow up and add all of these skills, and yet on some level sensing that “growing up” and wanting to cling to childhood. It is like a little bit of separation anxiety. Your preschooler wants to get old, but also wants to stay little. Of course, you have the personalities who want to grow up and never look back and the personalities who never want to grow up. Most feel a little caught in the middle. This can lead to a day where your three year old just refuses to put her shoes on or walk down the stairs by herself. These complex, battling emotions can manifest as disobedience, tantrums, and tears. Something to watch for with a preschooler is becoming wise in own eyes, meaning the child thinks he knows more or should have more authority than he actually does. Sheri said: Even though they seem so grown up some days… they are still little. I think I expect too much out of my daughter (age 4) sometimes. Expectations are good… but I have to remind myself to give her lots of grace too. See my post Peter Pan Syndrome and Three Year Olds for more on this topic. When Brayden was a preschooler, his favorite show was Curious George. The curiosity of that little monkey so fit in perfectly with Brayden’s personality and how curious he was about everything (and frankly, still is at 13!). Preschoolers want to know everything. Everything. They want to know how that works and why that happens. They want to ask the man in the restaurant why he is so fat or the lady at the grocery store why she is so loud. They will ask you about pooping while you are in the public restroom together. McKenna once asked a new friend of mine with a deep voice why she talked like a boy. Preschoolers want to know. They will ask no matter how socially appropriate it is. They don’t understand timing. While this curiosity can certainly lead to embarrassing moments, it is magical. Seeing the world through a young child’s eyes again brings it all to life. You know that sky you have stopped noticing? Your preschooler will notice it and every change. He will marvel at the colors and the clouds. The enthusiasm is catching and helps you appreciate little things again. If you are a mom who enjoys doing learning activities at home with your kids, you will especially love this curiosity. See my post on How To Do A Preschool Homeschool for help getting going. Preschoolers love to know why. This isn’t just with how things work. They benefit from knowing why when it comes to discipline, also. Read up on that here: Preschoolers and Discipline: Explain Why. Leeona said: All of my preschool age kids have been like Curious George. They have so many questions and want to learn and try new things. Mine often caused messes/disaster trying to figure things out. It’s sweet, and frustrating at the same time. This age takes a lot of understanding and patience. It’s the age I most look back on and miss with my oldest kids. Preschoolers can develop fears. It is a normal part of child development. Toddlers can seem fearless; preschoolers get scared of things we find silly as adults. In reality, most humans can get scared. Adults admit to having irrational fears. Some are afraid of bugs. Some are scared to drive in inclement weather. Some worry about accidents happening. Your preschooler will develop fears, also. It is key to stay sensitive to these fears. Just because you aren’t afraid of heights doesn’t mean your preschooler can’t be or shouldn’t be. Read up on how to help preschoolers work through their fears here. It seems crazy that you can spend so much time working on naps with your baby, and then over time, those naps go away. It was all worth it! Do not worry. Preschoolers do not need a nap every day. As a toddler, your child probably started to not nap 1-2 times a week. As a three year old, that will continue. The number of times a week your preschooler will NEED that nap will decrease over time. Hold on to that nap. Do not drop it. Your preschooler will still benefit greatly from doing rest time each day. Your preschooler will need a nap several days a week still, also. At age four, we officially move to rest time at our house. Before that, it is called nap time still. Read up on HOW TO KNOW WHEN YOUR CHILD IS READY TO STOP NAPPING here. Raising children really helps you get to know yourself better. Parenting preschoolers helps you recognize little idiosyncrasies and habits you have that you might not realize. Parents get a good look in the mirror as they watch the behavior of their preschooler. Preschoolers mimic what you do, and often do it in an exaggerated way. They are trying to copy you, so they aren’t really smooth about it. If you clear your throat every time before you speak, your preschooler might copy that, but the throat clearing will be very intentional and obvious. I remember the first time my children started copying things. I can still picture a little Kaitlyn intently rolling up her sleeves like she had seen done so many times. It is a sweet time and a revealing time all at once. You get reminded how much of what you do and say does not go unnoticed. Preschoolers love to laugh. This is one of my favorite things about a preschooler. They laugh and everything and have the cutest giggles. Because of this, they love jokes. Preschoolers love to hear jokes, and then, of course, love to tell jokes. Of course, a preschooler doesn’t quite understand what really makes something funny and what doesn’t. A knock-knock joke created by a preschooler rarely is funny nor makes any sense. That just makes it even funnier.